I was feeling so arrogant in the fall of 2006 that I thought I had heard everything worth hearing in rock 'n' roll. 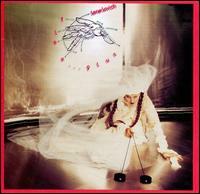 But the god of rock 'n' roll thought differently and introduced me to the name Lene Lovich. I not only hadn't heard her music at all, but I never even heard the name! And that was the moment when I realized how little I knew about anything. In fact, my confidence-level has pretty much been deteriorating since the fall of 2006 because my hair started falling out. 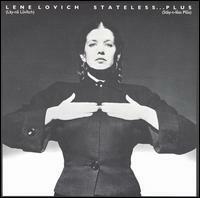 But anyway, we're not here to talk about me; we're here to talk about Lene Lovich! When you look back at the whole new wave movement, you immediately think one of its main goals was to be as totally 'out there' as possible. 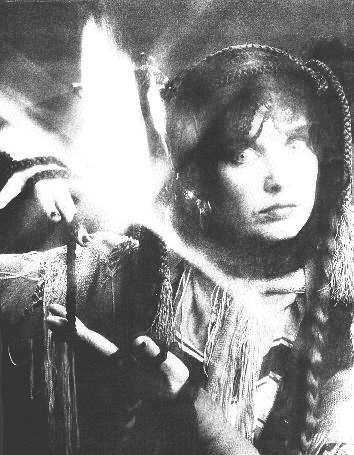 If that was true about anybody, it was definitely true about Lene Lovich. She's like a stiff-figured extra-terrestrial goddess who descended upon earth from her spinning flying saucer with only the purpose to become a pop star. It's kind of like Ziggy Stardust, except she actually sounds like she's from another planet. Her singing voice fills the album with a symphony of burps, squeaks, and whispers; she can warble as a commanding baritone, and she can screech at such a high-pitched that they would be sure to shatter your eardrums if the sound engineers weren't so merciful. And the songs! Some of them in theory are really quite normal, but along with Lovich's singing they typically find a weird rhythm or a funny synthesizer (at least) to keep the experience punchy. You might not like Stateless, but I don't think anyone can disagree that it packs quite a punch. The song that originally made the recording industry sit up and take notice of her was a craaaaaazy cover of Tommy James and the Shondell's “I Think We're Alone Now.” Yeah, that's also the song the 1980s teen crooner named Tiffany had a huge hit with! But the way music travels through the public consciousness, I'd wager that Tiffany is as well-known today as Lene Lovich. Well anyway, Lovich's version blows the other versions away more violently than Rambo III. Her arrangements consist of wobbly synthesizers, crazy back-up 'ooooh' vocals, and a really insane ultra-high-pitched wail at the end. (And the way they do those back-up vocals for the bridge to the chorus is classic.) Just to keep things accessible, they make the rhythms very steady and very clean. All of this combined with an utterly catchy melody makes it quite a fabulous experience. I highly recommend it! Even though that cover might have been what initially put her on the map (of the grimy underground), her most beloved song was an original called “Lucky Number.” It's the tune that opens this album, and it'll immediately blow you away with its tight, punchy rhythms, Lovich's ultra-playful vocals, and an array of unpredictably placed sound effects. That song came from music heaven, and it's catchy too. So good it is, in fact, that I sometimes have a hard time listening to the rest of the album. While most of these other songs range from good to excellent, nothing else really comes close to that. I mean, “Lucky Number” is pretty much genius. If nothing else, be sure you hear that one. But the follow-up to “Lucky Number” is quite good, too. It's called “Sleeping Beauty,” and it's not quite as fast-paced and punchy, but it's so freaking bizarre that I'd have to be a much better writer to adequately describe it for you! And even then, I'd probably take way too many words... At any rate, it has another catchy melody and some really weird sound effects interspersed throughout. What captures me most are the rhythm changes... specifically when that bouncy tuba line pops up—it gives me the goosebumps! After these first two songs, the rest of the album doesn't get as ultra-impressive as far as arrangements go... they tend to be far more 'normal' compositions. But 'normal' here is a relative term, and actually each and every one of these songs come with their own quirky edge. I'll mention a few up here, and then divert you to the track reviews if you're interested in more detail. “Too Tender to Touch” threatens to be an average lounge-pop tune... Take away Lovich's half-sincere, funny warble, it'd probably make a great tune for Frank Sinatra! The very entertaining “Say When” sounds like a sped-up hoe-down, and “Tonight” is an engaging ballad reminiscent of an average '60s pop song except it was twisted around its torso. “Momentary Breakdown” not only has that 'alien' style of instrumentation, but that ultra-cheesy organ riff makes it seem just a little bit creepy. Last but certainly not least is “One in a Million People,” which goes back and forth between a cheesy country-western-ish song and a cheesy Jewish-ish sort of song. I can't really say if that's such an adequate description of it, but it's dang brilliant if you ask me. The second album from our favorite rock 'n' roll space alien is exactly like her first in terms of style, and it's roughly of the same quality, too. That's great news to those who are so addicted to her quirky, bubbly style that they crave a second helping. But those of us who might have hoped to see her testing new waters would be disappointed. Listening to and reviewing Stateless, for me, was a wholly satisfying experience that I wouldn't trade for anything in the world, including a piece of bubble gum right now. Flex, while it is a good album by all accounts, just seems less fresh and edgy. To go further, the songwriting pales slightly, and her creativity went down the slightest notch. But, you know, the first album was so wild and creative, that something slightly less so is still pretty wild and creative! The album is certainly off to a strong start with the eternally quirky “Bird Song.” Opening it is a rather mystical synthscape that features Lovich's high-pitched bird calls, showing off her most incredible vocal range. After that extended intro, a bouncy new wave rhythm pipes up, like you'd expect it to, and Lovich embarks on one of her more memorable vocal melodies. The chorus, especially, is quite arresting with that army of Viking male singers on back-up vocals. “Bird Song” is one of those special sorts of songs that I gave an A+ to, but I still wouldn't quite put it over the level of “Lucky Number.” “Lucky Number,” of course, was a hyperactive masterpiece... this one's more goofy in a Monty Python sort of way. As you'd also expect after listening to the debut, most of these songs sound like she was going after a campy, B-movie space-alien vibe. The second track, “What Will I Do Without You?,” is exactly that. Compositionally, that's a not-that-unusual new wave song with a jerky bass line, but it has an appealing array of high-pitched and beeping synthesizers both incorporated into the rhythm and whizzing around in the background. “Angels” another one of the many songs with such sound effects incorporated into it, and that doesn't go unnoticed! That song is also more on the cheesy spectrum of things with its ultra-plain, fast-paced drum and goofy synthesizer loop. It reminded me of the more frantic “Say When” from Stateless except it's more restrained. Awww... Now, why'd she have to restrain herself? Lovich manages to hit my sweet spot with “Wonderful One” thanks to the prominent use of a xylophone in its rhythm. I'm not sure why, but every time I hear a frantic xylophone going off, I am happy. That's one of the many, many small reasons that I'm completely mental. But I also like that song's marginally catchy melody, especially the nicely done chorus. Another one of the highlights is “Monkey Talk” in which she turns in her most frantic vocal performance here with her trademark series of squeaks and giggles. It's still small potatoes compared to the wild way she sang in “Lucky Number,” but this still has its own charm. As you might remember, her debut album had an update of an old '60s song on it “I Think We're Alone Now,” which turned out to be weird, exciting, and in my humble opinion, greatly surpassed the original. Hoping to recapture some of that success, she covers “The Night” by Frankie Valli and the Four Seasons. Unfortunately, it didn't quite work. Its pace is rather sluggish and it lacks spirit. It's a fine listen, but it comes nowhere near surpassing the quality of the original. Oh well. Also rather weak is “Egghead.” While the incredibly jerky melody is certainly quirky and unusual, the melody is incredibly dull, and in the end, it just seems hollow. “You Can't Kill Me,” which seems to escalate into an all-out space-battle, undoubtedly features the most impressive sound-effects of any track here, but its two-chord harmonies show that it was horribly lazy songwriting at its core. “The Freeze,” also heavy on the sound effects and light on the songwriting, brings the album to a disappointing conclusion. It trudges along at a dreary pace, which doesn't help me enjoy it any more, but at least the sound-effects are weird enough to keep it interesting. The combination of sea sound effects with space synthesizers has me wondering about it! The melody also sounds like an old British sea shanty. This was an unusual idea, but unfortunately it just didn't take off. Lene Lovich's sophomore release is a weaker version of her debut, but if you've fallen head-over-heels in love with that one, then you'll probably be similarly delighted with this. As icing on the cake, the CD makers included “New Toy” in the bonus tracks, which is one of Lovich's more purest of delights. ...If nothing else, you should hear that song. And “Bird Song,” of course.